Join us for the Tenth Annual Traverse City Zombie Run, Saturday, October 27th, 2018. The Zombie Run has become a Traverse City Halloween tradition. What's not to like? Zombies and beer have always been a winning combination. Stick around after the race for the medal ceremony and best costumes prizes. We may have a few other surprises as well. Plus the beer will be flowing, who says you can't drink before noon? Besides, you’re already dead anyway! 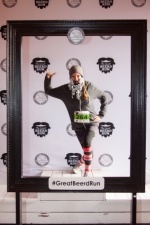 Join us November 10 for our fifth annual Great Beerd Run- a 5k fun run designed to celebrate all things Beer and Beard. This is an untimed run with on course beer tastings featuring Beards Brewery, Short's Brewery and Right Brain Brewery. In addition to celebrating our runners, we are hosting a Best Beard competition with both natural and assisted categories. Your registration fee includes race entrance, knitted beard beanie, bottle opener/race medal, 3 beer samples, one glass of beer during the post-race party and entrance into post-race party featuring live music. It's that time again! The 11th Annual Up North Media Traverse City Turkey Trot presented by 4Front Credit Union is a family favorite! We start Thanksgiving day off right with two different race distances; a 5K and a 5 mile. All runners receive a commemorative long-sleeved Turkey Trot t-shirt as well as a cooler lunch tote loaded with awesome SWAG worth well more than the price of entry! Invite the whole family to participate in this one-of-a-kind event in Traverse City, MI. Proceeds benefit the TART Trails and youth organizations/teams in Traverse City.